The Columbia Memorial Space Center located in the City of Downey is a unique space science learning center focusing on engineering, technology and science. Its goal is to teach young people about space exploration and aviation with fun, hands-on experiences. 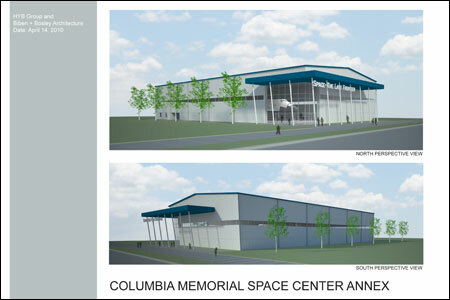 Two conceptual plans were prepared for a new 33,600 square foot Annex to display a full size model of the space shuttle. The Annex would contain a covered entry area, lobby, reception, main display hall, simulator, 2 classrooms, offices and support spaces. A cost effective warehouse space was proposed using a steel frame clad with aluminum panels. The main hall would include exhibits, educational material and an “observation walkway” over the space shuttle.